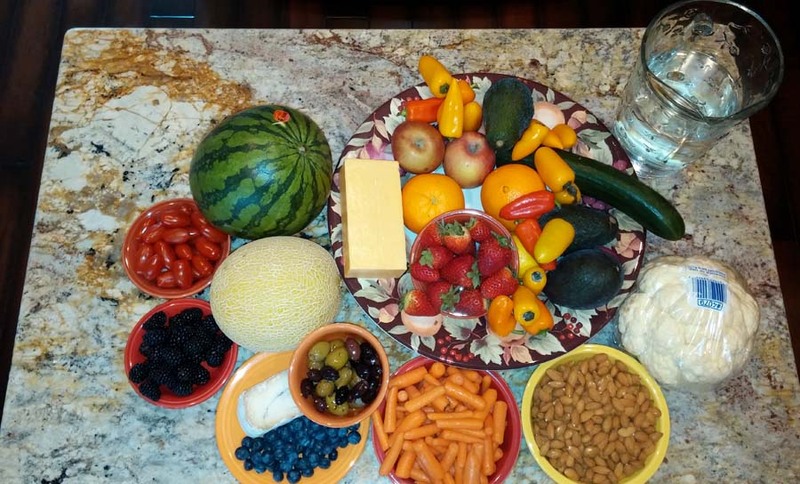 A friend of mine initiated a “Clean Eating” challenge; a call to eat healthy, whole foods and avoid additives. It’s only a week long challenge, so I thought, “Hey, Brian’s out of town, I’ve kind of fallen off the wagon since Christmas, why not?” I’m in! She suggested that before we begin, we need to clean out of our pantry things that have lots of additives, like cookies, donuts, and cheese crackers. And, she suggested we purchase things that look like they did when they were in the garden, or in the pasture. Oh, and drink lots of water. Excuse me for a moment, I’ll be right back. The reality is: this is a good challenge! There are too many unnecessary additives in my pantry, and therefore in my body: added salt, fats, preservatives, flavorings, dyes, and chemicals. For the most part, Brian and I do eat healthy at home (with only the occasional bacon drippings! ); but we do enjoy eating out regularly… and who knows what we’re putting into our bodies then. I think it’s also a good idea to take a long look through our spiritual pantry as well! We may think that we have only the pure Gospel, but sometimes when we read books about the Bible, listen to radio sermons, click on social media links, or sing along with our favorite songs we might take in questionable theology. We may find ourselves adhering to practices and doctrines that change the color of the truth, add worldly flavors, and fatten up the true Gospel. Unfortunately, there are people who think the Gospel of Jesus is not palatable by itself; it needs to be sweetened up or watered down. What is the pure Gospel, without any additives? Jesus! To believe in the Lord Jesus Christ – a decision and commitment that is made in this life on earth – is to have eternal life with Him in heaven. Jesus is not suggesting that perhaps if we believe in him, we might end up in heaven; he is assuring us that anyone who believes has eternal life. To eat of Jesus is to appropriate him for ourselves. It is to take him into our being. It is to come to Jesus, believe in him, receive him into yourself and then commit your life to him. Jesus then lives in you. He sustains you. He is the true bread who is the staple of your life. No additives are necessary for salvation. Everything we physically eat has to die. Once a fruit or vegetable is harvested, it is no longer living and growing. It has been cut off from its life source. The same is true for every piece of meat, chicken or fish. We eat dead things. Their death sustains our physical life. Jesus died to provide life and he lives to sustain our spiritual lives. Does it seem too easy to simply believe in Jesus? Is there something we should do to earn our salvation? That’s it! That’s the clean Gospel. Once you are saved, God will have work for you; work that is the outflow – the proof of your salvation – not the requirement for salvation. Have you added something, anything to the Gospel? Do you need to do a spiritual pantry purge? It is amazing how good clean eating can be. It is amazing how good Jesus tastes when everything else is removed. Being a Christian is easy. We make it hard. Amen, Amen!! I really like this analogy. ❤️Thank you. I am so glad God uses these little nuggets. Great comparison, Marcia! We just returned from spending the winter in Arizona. We ate out and ate desserts regularly. Although we got plenty of out door exercise I gained 10 lbs. even though we purchased a scale. I’m going to stock up on fruits and veggies and make some soup. Psalm 34:8 is a perfect verse. We should know how important water is to help keep us healthy because Jesus called Himself the Living Water! Loved this!!! If we just put all our time and energy into how our spiritual life looked to our Savior as we do into our appearance to others, I think our health and figure would just fall into place. We need to always strive on what really matters!!! !